When magic has gone from the world, and a vicious king rules from his throne of glass, an assassin comes to the castle. She does not come to kill, but to win her freedom. If she can defeat twenty-three killers, thieves, and warriors in a competition to find the greatest assassin in the land, she will become the king’s champion and earn her freedom. Her name is Celaena Sardothien – beautiful, deadly, and destined for greatness. 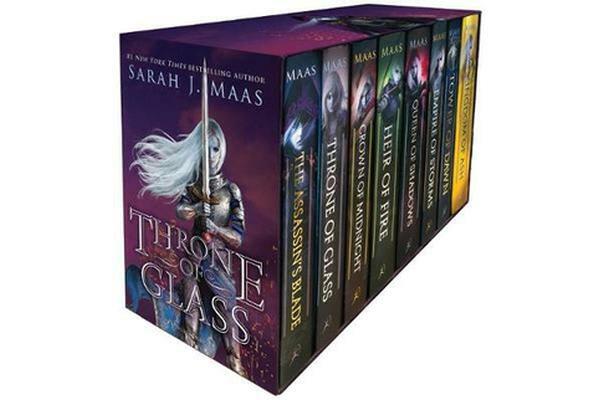 Fans new and old will dive into this special box set that contains a 4-color poster and hardcover editions of the entire series: The Assassin’s Blade, Throne of Glass, Crown of Midnight, Heir of Fire, Queen of Shadows, Empire of Storms, Tower of Dawn, and the thrilling finale, Kingdom of Ash.